Our mission servers are a beautiful complement to our dining room tables. Please scroll down the page for more details on our servers. If you're unsure about the finish for your server, we encourage you to order wood samples. Color accuracy on our website cannot be assured due to a number of variables including lighting, the camera used, and the settings on your computer monitor. 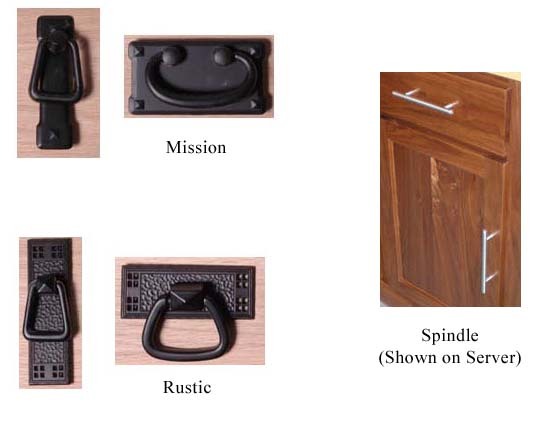 We offer three standard hardware choices: Mission, Rustic and Spindle. You can see photos of this hardware here. Custom Hardware: If you would like to send us custom hardware, we can use that on your new piece. We can also order any hardware from the hardware distributors limited catalog (clicking on this link will open a new browser window). It is important to let us know your choice as soon as possible when selecting custom hardware, so as not to delay delivery of your furniture. In all cases, the appearance of the hardware may differ slightly on your piece. For example, we may need a vertical pull while the photo on the website shows a horizontal pull. The hardware will always be of the same color and style that you select, but the shape and size may differ to better match your furniture piece. You may choose to have a backboard on your server, or to have a server made without one. You can see a photo of this difference by clicking here. We can add a wine rack to your mission server. We will discuss the placement of the wine rack with you prior to beginning work on your piece. (This option looks best when one rack is added to the center of a three-door server, or two wine racks are added to the center of a four-door server). In order to house the 45 degree angle wine racks properly, minor modifications to the proportionality of the piece may be needed. 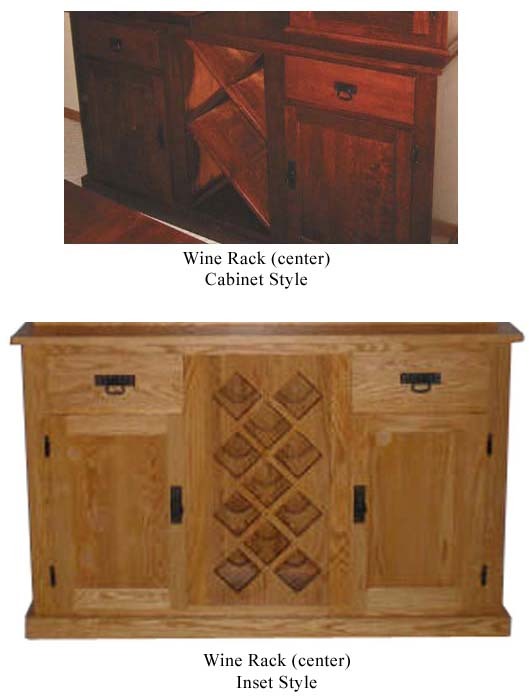 Here is a photo of a wine rack added to a mission hutch. Please see our shipping guide for more details. To see additional photos of our mission servers, see our Flickr photo gallery. Clicking on this link will open a new browser window. Harmony Cedar mission servers are individually handcrafted by Amish craftsmen with decades of experience. Creating a beautiful, durable piece of furniture requires this level of expertise. Each server is created by hand by Amish master craftsmen and is carefully inspected individually prior to shipping to assure its quality. To assure this quality, we offer a full money back guarantee and a full one year warranty against defects on our servers. Please click here for more details on our 100% quality guarantee. We encourage you to view the comment cards and emails sent in by our customers. There are well over one hundred posted on our website. You may order directly online through our secure server, or call us at 1-888-959-8899 and order with a 50% deposit.